This history has been developed to give a snapshot of the development of this Church to the present day, and as a way of thanking those faithful folk who have gone before us. A special thanks for early information to Rev. Stan Solomon - Mackay Church Secretary in 1958. The Baptist Home Mission commenced and funded a Church planting process in Mackay. Norm Mergard - Pastor (Home Mission). Norm was a driving force behind the early life of the Church and was still fondly remembered by our last original member still in Mackay (Mrs Grace Gibbins) Who went to be with the Lord in 2006. 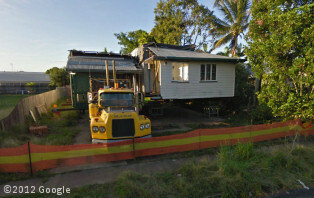 Early 1958: A Manse was purchased at 28 Wentford St Mackay. The Baptist Home Mission evidently paid the initial expenses. March/April: Group meetings and services began in the Manse on the verandah. Two young men - Laurie Kingston and Ian Florence - came to live in town to assist with the work. 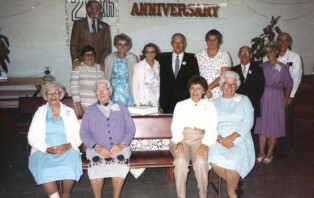 August 31: The Mackay Baptist Church was formally Constituted with 30 Foundation Members. October: The properties at the corner of Brisbane & Shakespeare Streets were bought and one of the two old cottages was converted into a meeting room. The other served as classrooms and kitchen. 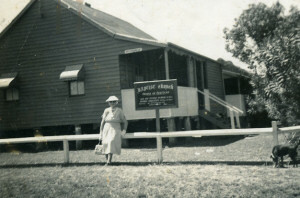 December: The original church building was built over the Christmas holidays with assistance from a Rockhampton builder, Bill Simpson, and another Brisbane volunteer. Folks from within the Church donated their time and labour under Bill's supervision. This was a massive feat achieved in a very short time. A labour of love. For years afterwards people would still talk of the joy and excitement in this project. Photo of cottage at MBC site. 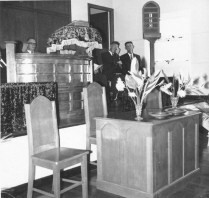 February 14 - Official opening of the Church Building Cnr. Brisbane & Shakespeare St. Mackay. N.H. Suffolk Pastor. Neville remembers the fellowship fondly as being made up of hard working faithful people. This was a time of consolidation, with strong links with other churches in Mackay. Neville is particularly remembered as a good mixer, and a solid preacher. A property was obtained at Sarina, and outreach activities commenced there. Rob. Paulsen - Pastor - A strong youth Ministry, although for many years, up to around 1996 youth tended to leave town around 18 and go to Brisbane for education and career options. Remembered as having strong Sunday services with a lively musical ministry. John & Heather Mills, currently Pastor John Mills at Margate Baptist Church were the Youth leaders. Len Maycock - Pastor - A Solid time of teaching and a strong personal counselling ministry. A strong preacher. is the next door guest house at 144 Shakespeare Street. C.H. Nicholls Pastor - Brief interim ministry - 6 months. Rod Bulpitt - Pastor with the arrival of a student pastor and wife in their early 20s, the church experienced an influx of young people who sometimes tested the patience of older members. This was a time of expansion, evangelism, and experimenting with new ideas, that was unexpectedly curtailed by the return of the Bullpitts to meet Theological College study requirements. Dec to Feb: Interim Pastor I Cathie. June to Oct: Interim Pastor G. Tudball Smith. The work at Sarina was concluded and the property and contents were sold. Overall leadership by Deacons punctuated by interim ministries. Dec, Jan - Pastor J Steer. Jim Watson - Pastor. This was a period of quiet consolidation, and stable development. By this time the Church had attained financial independence from its' Home Mission beginning. Alan Gordon - Pastor This time in the Church saw exciting growth, and the eventual introduction of a second Sunday morning Service. Crusades every year were held with an emphasis on Church growth and evangelism. A strong Youth work was a feature of this period. During this time there was serious consideration of relocating the Church, but despite preparedness to move, and much searching the Lord led the church to remain at the current site. Alan had a strong emphasis on Church Growth. Church Hall Built. This was a great project that was achieved debt free through donations and volunteer effort. Special mention should go to the then Church Secretary Paul Andersen who coordinated the effort. The church hall (Photo from 2005). 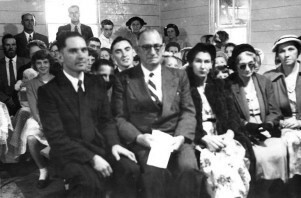 All Church Services moved into the Church Hall during the Ron Baker Crusade. Services remained there after that. Trevor Walmsley appointed Associate Pastor. Trevor is currently pastoring in Victoria. Trevor led an outreach to Carmilla, which finally concluded in 1989 due to lack of response. Don Moore - Pastor. There was continued growth in this period, with a strong personal inter-generational ministry. A caring personal counsellor. Many unchurched folk came into contact with the fellowship in this period. Purchase of Property at 142 Shakespeare St. Quite a large block with an old house on it. This added a neighbouring property for possible future expansion. The manse in Warland Street was sold. can also be partly seen on the left. Jeff Grant - Pastor. A highlight of this period was the development of the Street Level Youth Care ministry, feeding street kids from a van on the Church property. Three families from the Church were commissioned to commence a church planting process in the Northern Beaches area. Purchase of a property at 144 Shakespeare St. This was an old guesthouse between the church blocks. The Guest House was demolished and the land used for parking and possible future expansion. This gave the Church 4 blocks from 142 - 148 Shakespeare St. Leadership by Deacons. This was a time of growth and healing within the Church. The house on 142 Shakespeare St had been rented, and now was gradually renovated to the point that it could be used as the Manse in 2002. Much consolidation occurred in this time. February - Jock Whittaker - Pastor. The Church has been in a time of exciting growth, with numbers increasing so that the property cannot comfortably house our Worship Services. Wherever the people are is where the Church is. There is a great emphasis on worship and a strong leading for personal and corporate growth. We are excited!!! 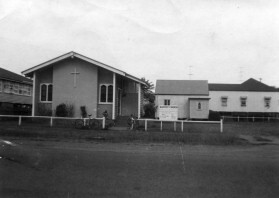 The Northern Beaches Baptist Church was constituted. A very close working relationship exists between the two Churches. 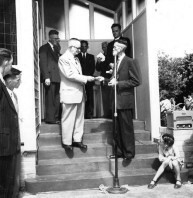 John Whitborn was called by the Beaches as their pastor. The Church appointed George Williams as paid Youth Worker. Youth and Young adult work is flourishing. The church has been rapidly growing. April - Morning Services moved to Mackay North State High School Hall, due to the increase in numbers of people attending. 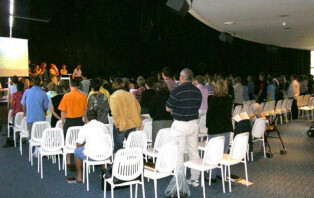 On occasion, worship services have also been held at Mackay Entertainment Centre. Wherever we meet for Church services is called the "Worship Centre". A period of solid growth in the Church. Our facilities are stretched on a Sunday especially. Services returned to the Church buildings for the cool conditions in the Summer, and dual services continued. Many healthy Ministries are flourishing Nina Wiesenekker appointed as Church Counsellor. Pastor Jock Whittaker agrees to a further 5 year call. In partnership with Bapcare the Mackay Baptist Care Counselling service was established. Church building Plans underway for Development on the current site. Paul Polgeiter pastor of Northern Beaches Baptist Church. 50th Church Anniversary. 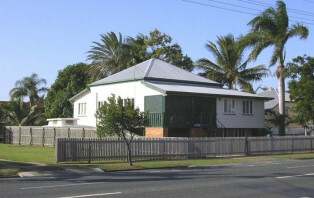 Through an agreement with BapCare, a building was purchased at 58a Wellington Street Mackay to become the base of Mackay Baptist Care. This ministry continues to grow with regular courses offered for depression and anger management amongst others as well as normal counselling services. More information on this ministry can be found at: Mackay Baptist Care. Church property redevelopment activities continue. Relocation to temporary site - 245 Bridge Road during the demolition of the old site and commencement of construction of the new church. 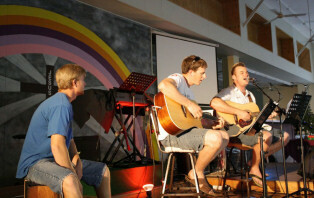 The last church service in the old church building was held on 11 April 2010 with family members sharing their stories of the way in which God uses what he has given us to bring glory to himself. The original church building (now church hall) was relocated to another site to be converted into a house and re-uses some of the materials from the main church building which was demolished. The old manse was sold to a property developer and relocated to 38 Stayts Road, Marian. May: Commencement of the new property construction phase. Dave Harney Constructions was commissioned with the building which was designed by Steve Turner of Sanders Turner and Ellick Architects.Steven Tye was the church property project manager. Significant practical and financial contributions were made by many church members and God was especially gracious in binding the Church together during this busy time and performing many miracles in the provision of funds, safety, practical helpers and solutions to unsolvable problems. The church commissioned two short-term missions to Vanuatu, to minister to the people of Blank Sands Community and Pele Island. This excercise was in support of our partner church, "History Maker's Church" in Port Villa. Property progress video - July, 2011. 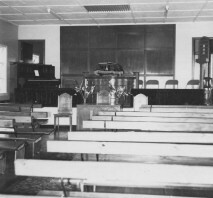 January 1: The first service was held in the completed building on New Year's Day. 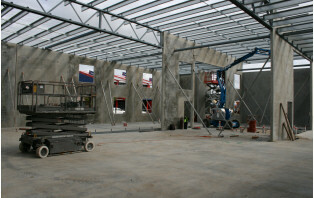 The building project overall was completed on time and on budget. 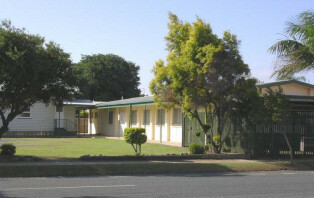 April 21: Community open day and official opening of the building. The new building was full with church family, past members, friends and official guests as well as former pastors, Ps. Jeff Grant and Rev. Alan Gordon. Two more short-term missions trips were commissioned to Vanuatu. The church has continued to grow numerically and in depth of our relationship with God through Christ Jesus. A large number of baptisms were held this year. 2 more mission trips to Vanuatu. New church web site released. Appointment of Ps. Peter Muller as full-time associate pastor. Ps Jock Whittaker is appointed as Senior Pastor. Ps. Jock Whittaker retired after 15 years of faithful service. Ps. Scott Jones appointed as new Senior Pastor. Ps. Rohan Beatson appointed as Associate Pastor. The Mackay Baptist Church is people. Wherever we have been through the years, or wherever we are now we remain God's people in a world that needs to know Jesus Christ. We pay compliment to those faithful workers who over the years have sought to witness to the Love of Jesus Christ in Mackay, Queensland. Every effort has been made to make this history as accurate as possible, our apologies for any inaccuracies. Any input, additional information or anecdotes can be sent to the Church Office.